Rest in Peace and Eternal Memory, Terry. In the past year and a half, I lost too many loved ones. 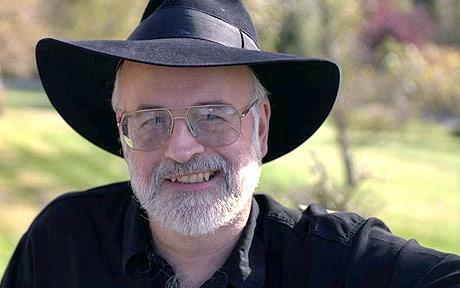 Today’s news of the very untimely death of Sir Terry Pratchett, one of my all-time favorite authors, made me re-live those losses and cry for a person I barely knew. Or, did I? My first introduction to Sir Terry’s works was nearly accidental. Back in late nineties, I — at the time an aspiring fantasy author — decided to attend an author’s event at Vroman’s bookstore in Pasadena, to see a bestselling author with my own eyes. Terry Pratchett. ← Celebrate “Read an Ebook Week” with Dragonwell Publishing! I never did get into Terry Prachett’s work yet. I guess it’s about time. I didn’t read his books as often as I’d like. But I enjoyed what I read and my sister is a big fan. I’d definitely recommend him. His early works were his funniest to me but they were all great books.